Need a multipurpose invitation card with an elegant design that can still be used for formal dinner events? If yes, you should try using banquet ticket templates instead of using regular ticket templates. In this article, we provide examples of downloadable banquet ticket templates and how you can use them for a specific event or occasion. Aside from directly giving to charitable institutions, one way to raise funds for a specific philanthropic cause is by organizing events where guests pay for a spot to attend the schedule event. In these events, guests basically pay for their tickets (which are usually priced in the hundreds of thousands of dollars). Proceeds from the banquet ticket sales are then given to the contracted charities or used to fund a specific cause. 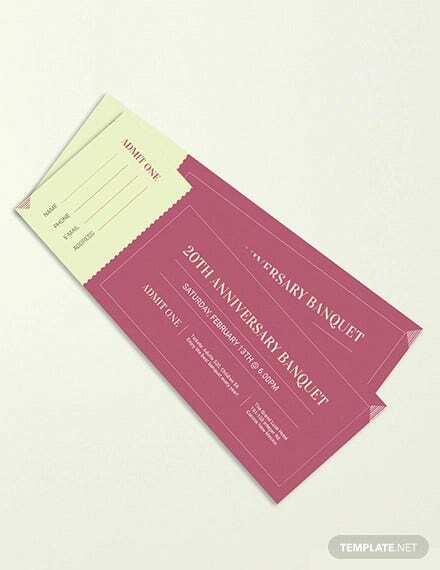 Banquet tickets, therefore, are the printed documents that guests receive as proof of admission. The more formal the corporate event, the more expensive the ticket price. 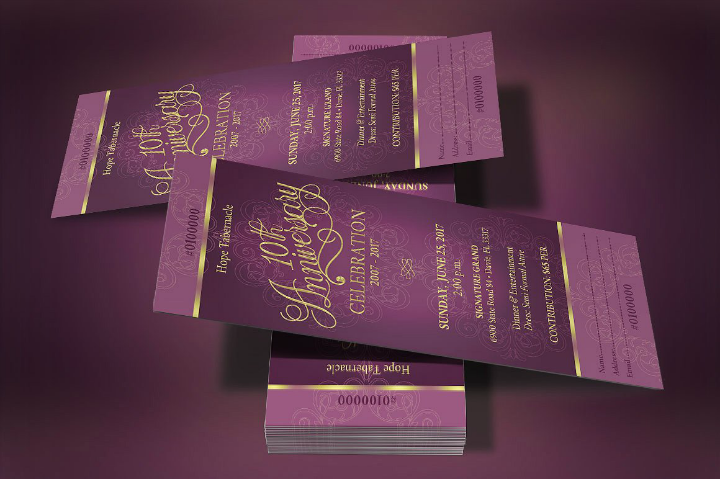 Formal banquet tickets are also designed to match the event’s theme or cause. If you are planning a gala event, banquet, charity ball, conference, or a convention and you intend to include a seated formal dinner with the event, you should also make sure that the ticket design you use will complement the event itself. And, to save time on creating a ticket template design from scratch, you may use banquet ticket templates instead. 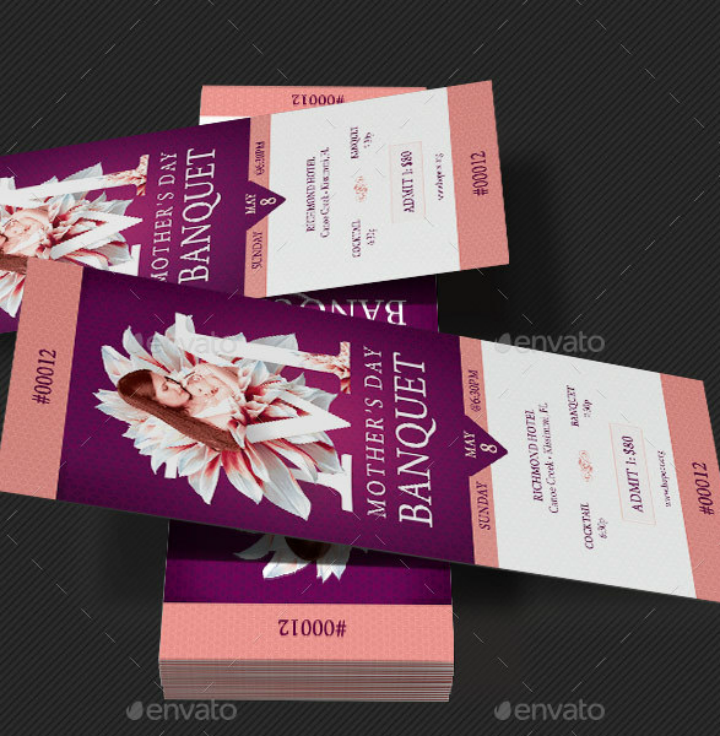 Embedded below are different banquet ticket templates. All of them are downloadable as either Photoshop or InDesign templates. Make sure you have a compatible software program that can open the files before you edit them. 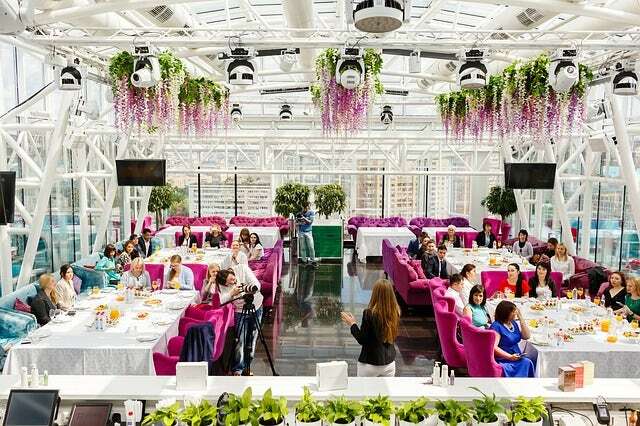 Anniversary gala dinners are often held during reunions and other yearly events. So, if you are in charge of planning the event, use the Anniversary Banquet Ticket Template (shown below) to make your life easier. 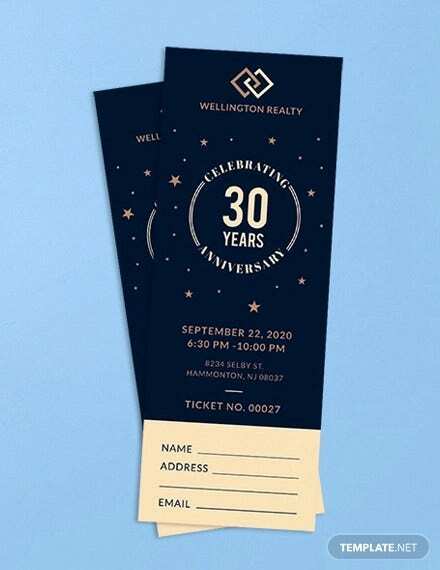 This ticket template features an elegantly designed corporate invitation card portion with the ticket stub attached to the bottom portion of the card. Even if this specific template is worded for a church anniversary event, you may still use this banquet ticket template for other occasions like company benefit dinners, charity balls, and holiday fundraising galas. When printed out, this template measures 3 inches by 7 inches, including the cut-out ticket portion. All the text and graphic design elements are customizable in Adobe Photoshop. You may also choose between four color variations (blue, green, teal, and brown). Remember, all templates also have a hint of golden font colors on the text elements. 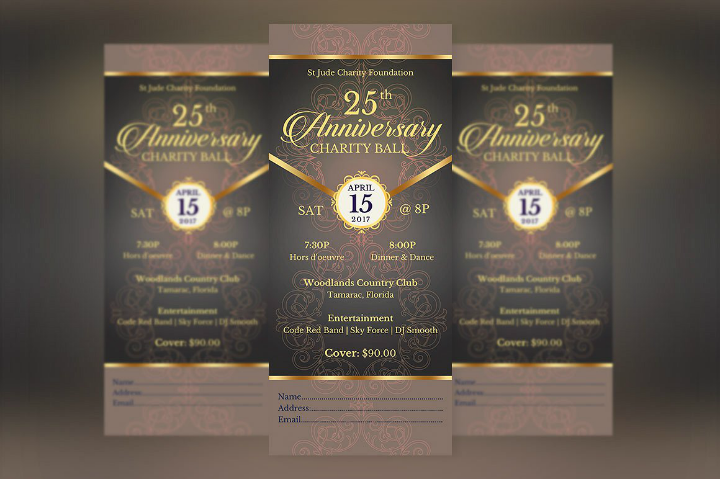 If you are planning a formal ball where guests pay for a seat to benefit a specific charitable organization, then you would like the Benefit Anniversary Banquet Ticket Bundle Template (featured below) to be used as the event invitation card. With this template bundle, you may choose among four ticket templates in different color schemes. 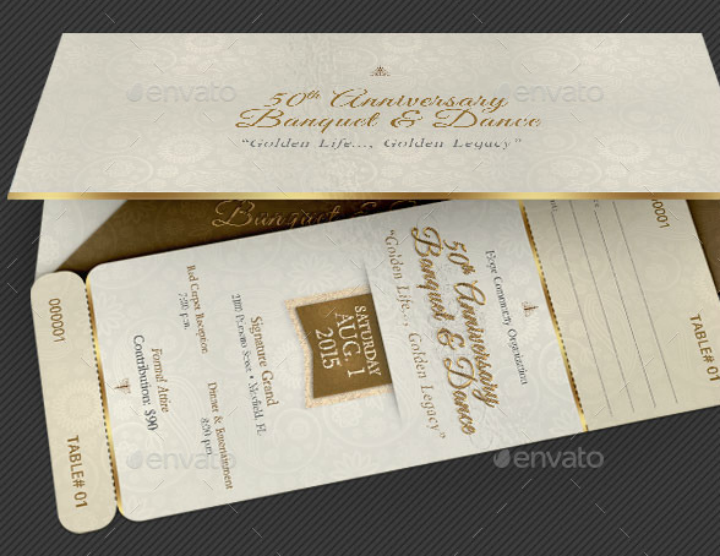 The ticket template mock-up shown above uses a vintage brown background and gold font color scheme. Print it out on cardstock measuring 3.25 inches by 7.25 inches to make the ticket more formal-looking. Note that this template was created and stored in a software program called Microsoft Publisher. Therefore, make sure that you have this software program installed on your computer before purchasing it. Do you need to follow a specific color scheme for a banquet or charity event you are planning? 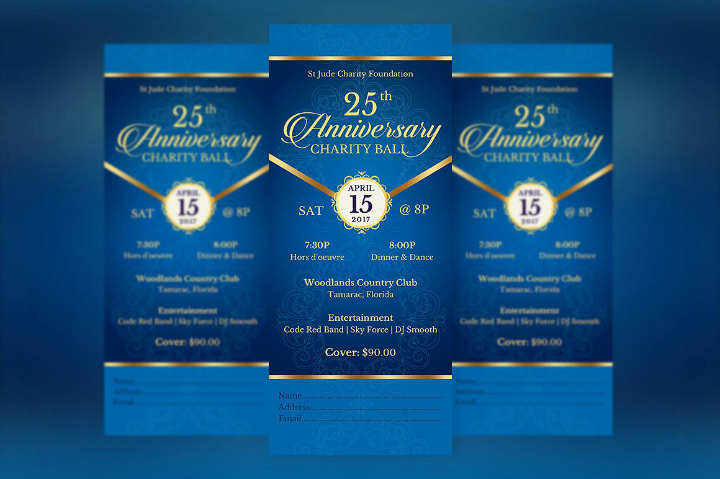 If yes, try out the Blue Anniversary Banquet Ticket Template shown below if you are using a blue color motif. This printable ticket template is fully editable. You may change the template’s header wording and all the text placeholders to match the specific event you are hosting. In addition, you may also customize the blue background color and change it to a different shade or replace it with another color altogether. 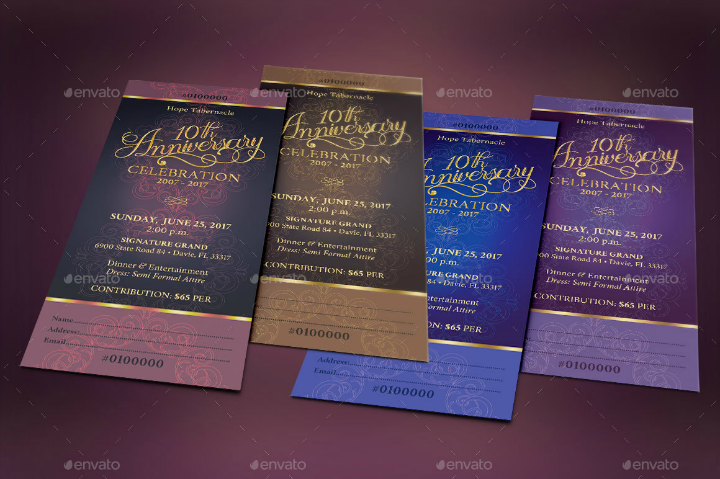 If you want to have golden foil textures or accents on the printed ticket, it is best to have the template printed at a professional print shop. But, if you already like the current template design, you may use your own home printer as well. The template measures 3 inches by 7 inches when printed out. This means that you can get two tickets on one standard letter-sized paper. Are you hosting a charity banquet this autumn? If yes, we got you covered with your ticketing and invitation card needs with the Charity Autumn Banquet Ticket Template (shown below). 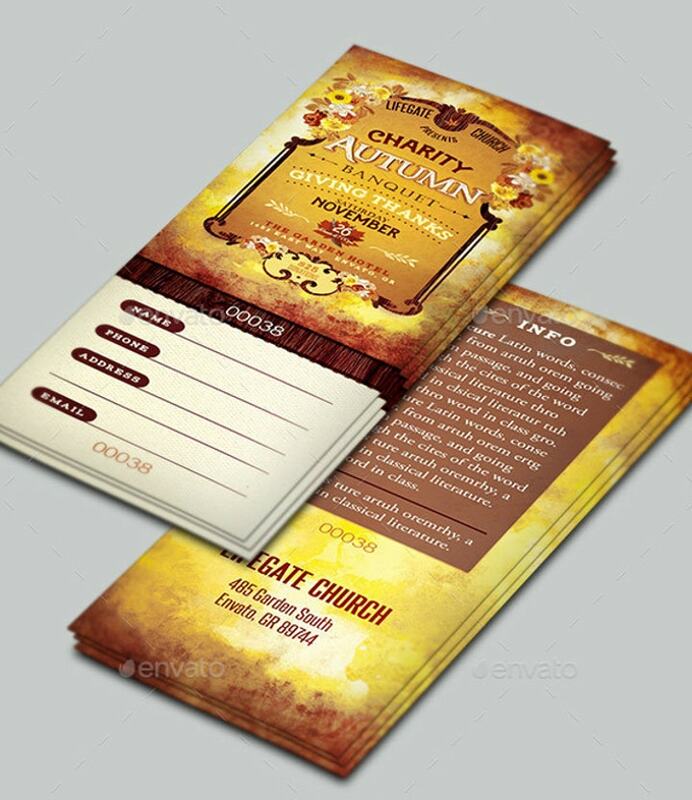 As its name suggests, this ticket template is best used for charity events held during the fall season. It contains autumn floral graphic design elements that are mostly associated with the season. Also, it uses corresponding cursive font styles that help accentuate the ticket template design. Event planners may also choose among six color palettes. Before printing, make sure to adjust your printer settings since this template prints out on both front and back portions. You may also use this template as a flyer template or as a leaflet template as long as you do not include the ticket stub portion. 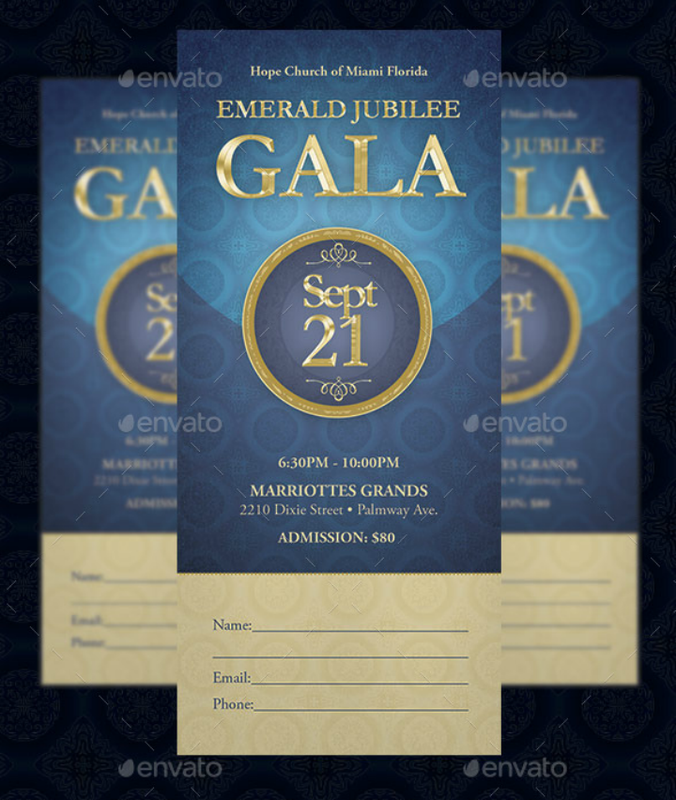 The Church Anniversary Banquet Ticket Template embedded below is a perfect example of a ticket template for a formal ticketed church event. Use this template if you are planning a church anniversary banquet while making sure that your churchgoers understand the purpose of the event. Aside from this use, this banquet ticket template may also be used for other non-religious dinner events. This template does not include a large ticket stub portion. Instead, you will find a portion of a small serial or tracking number. Doing this makes the ticket invitation retain its formality. This template has four color options (teal, orange, green, and pale blush). The template measures 3 inches by 6 inches with an additional 0.25-inch printing bleed. All Photoshop layers are labeled so that it will be easier to edit. 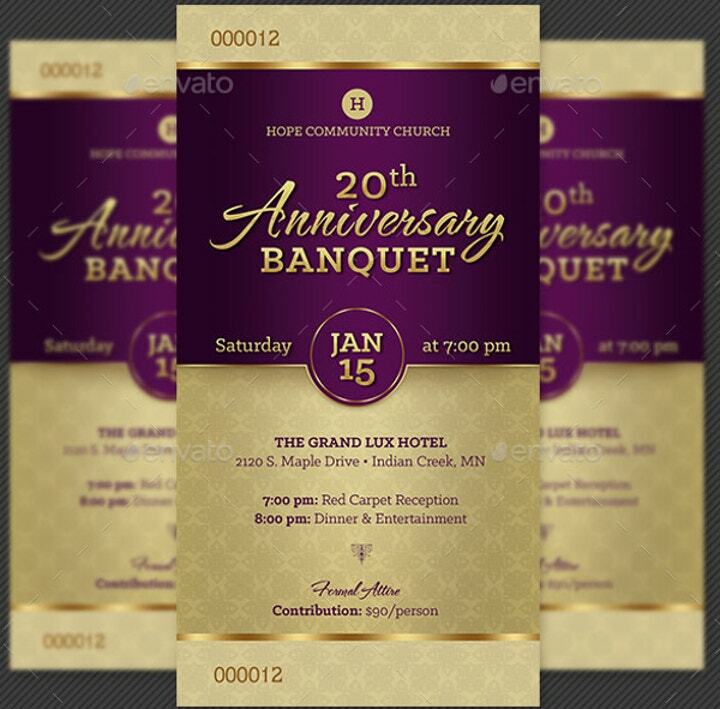 The Elegant Church Anniversary Banquet Ticket Template shown below is a perfect blend of elegance and functionality. Use this ticket template if you are planning a banquet event for hundreds of guests. By downloading this template, you can choose among eight color options (blue, brown, purple, dark violet, gray, dark blue, green, and teal). Note that all these color options will have hues of gold on it. In addition, this template makes use of elegant typography fonts to further emphasize the sense of formality associated with this ticket template. Tickets derived from this template measure 3 inches by 7 inches, including the ticket stub portion. All images have 300 DPI screen resolution and follow the CMYK color model. This ensures that the digital template quality is the same as the printed version. 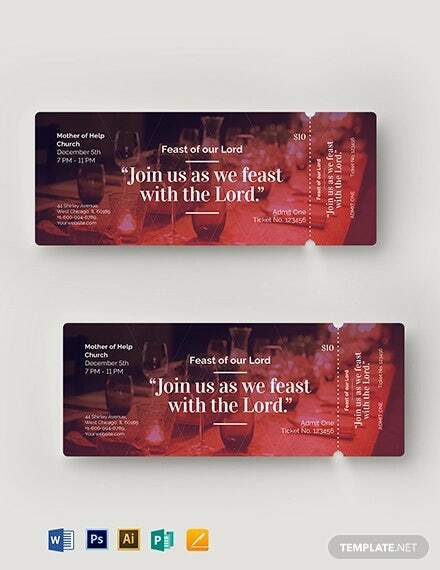 The Folded Banquet Ticket Template featured above is the ticket template you are looking for if you want a better lead-up to the banquet sample invitation card’s real purpose. The template also allows you to choose between five color variations (blue, purple, red, teal, and green). All text and graphic elements are organized into layers to make sure that they will be easy to edit. Also, downloading this template gives you access to two PSD files (front and back portions of the ticket). 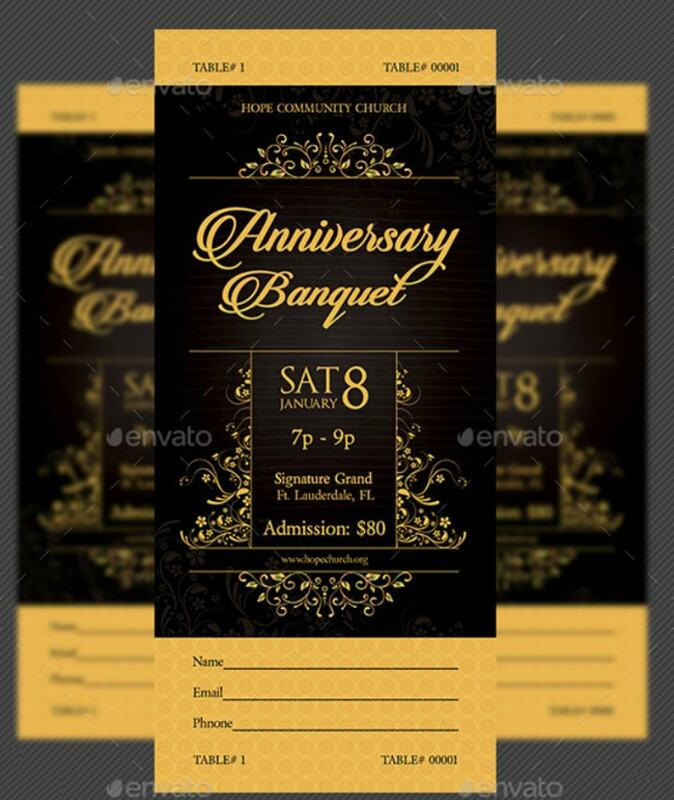 For those who want to reinforce the formality of an event through their ticket template design, you will appreciate the Golden Anniversary Banquet Ticket Template shown below. Use this printable ticket template for formal banquets, charity balls, class reunions, and homecoming parties. Aside from the gold color version of the ticket template, you may choose from five more color variations (peach, blue, green, purple, and blush). Prepare thick paper or cardstock measuring 3 inches by 7 inches when printing out this template, or you may also use one standard letter-sized paper to print out two ticket templates. 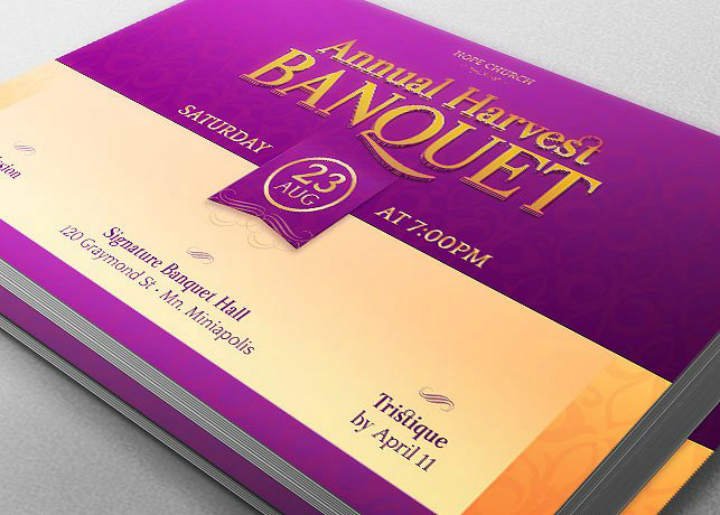 Use the Harvest Banquet Ticket Template Bundle shown above to print out tickets for banquets, concerts, charity events, and conventions. This template bundle also includes a postcard template and a flyer template. It is best to use all these forms of print advertising in order to spread the word about your charity banquet event. The ticket template measures 2 inches by 6 inches when it is printed. 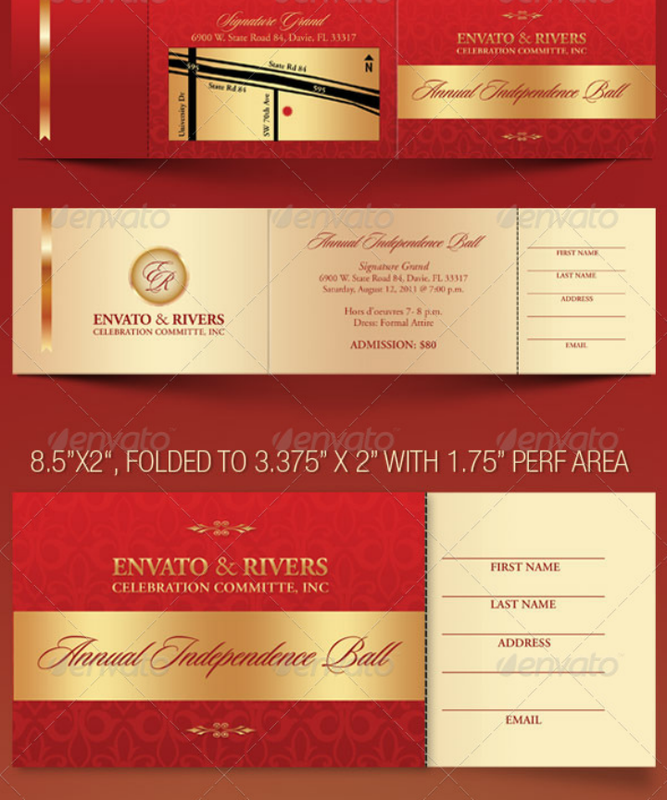 Choose the Luxurious Anniversary Banquet Ticket Template shown above if you want to wow your guests with your invitation ticket design choices. This ticket template also works well if you have a well-planned event at a well-decorated location. The template’s color scheme is very subtle—making the template fitting for use in both formal and casual business events. This template comes with a folded cover design and the perforated ticket stub has curved edges to differentiate it from the rest of the whole ticket. The ticket template measures 3.25 inches by 8 inches while the ticket envelope measures 3.75 inches by 8.25 inches. You may also choose from four color variations (champagne, blush, pink, and teal). Planning for a Mother’s Day event? 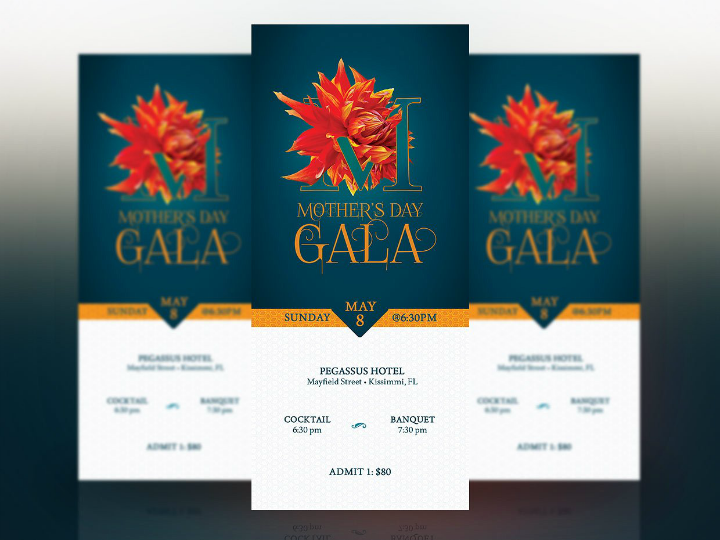 Why not hold a dinner banquet and use the Mother’s Day Banquet Ticket Template (shown below) as your ticket invitation’s template design? This Photoshop ticket template measures 3 inches by 7 inches. It is also available in six color variations (pink, lilac, blush, purple, red, and blue). As with all Photoshop templates, make sure that you have the software program installed on your computer before editing. And, if you want to include your organization’s branding elements into the template, you can add your company or church logo during the editing process. Is it time for your pastorship’s anniversary? 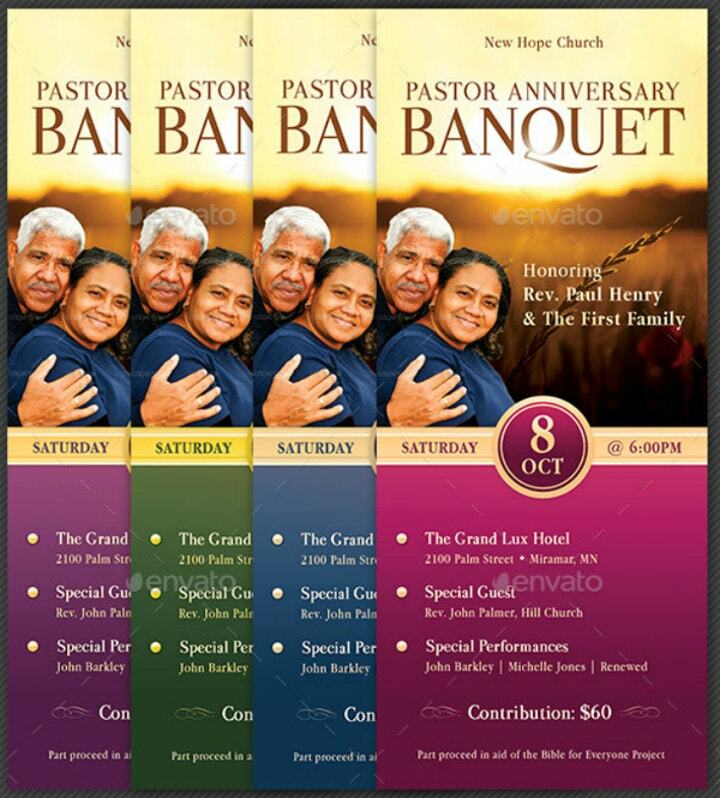 If yes, use the Pastor Anniversary Banquet Ticket Template shown below as the template for creating a ticketed anniversary dinner event. This template prints out on either regular paper or on cardstock measuring 3.25 inches by 7.25 inches. But, if you want your banquet ticket to appear more credible, it is best to print it out on cardstock instead. 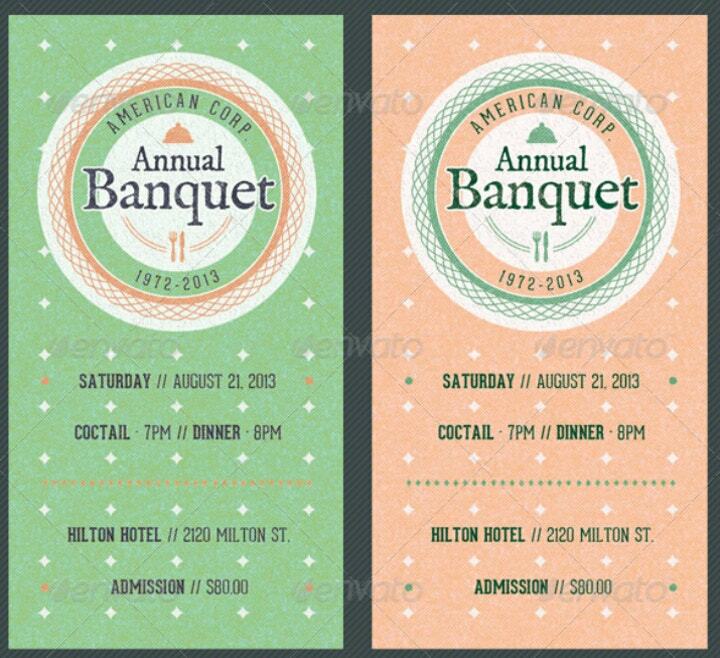 Want a trendy vintage-y look for your event’s banquet ticket template? If yes, you will like the Vintage Banquet Ticket Template shown below. 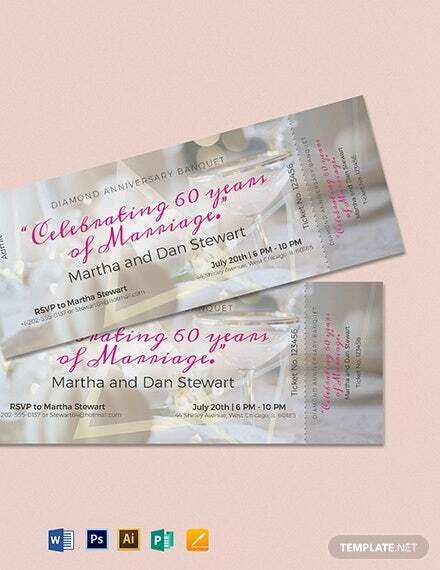 This ticket template measures 2 inches by 4 inches and it is available in four color variations (light green, light blue, pink, and blush orange). To make your ticket design more appealing, always include an event company logo or illustration on the heading portion of the ticket. This helps attract a reader’s attention and lets him or her pay more attention to the ticket details. Also, do not hesitate to spread the word about your organization or general company by including your social media links. Have you chosen a banquet ticket template? When choosing a banquet sample ticket template, always be mindful of how you want your event (and, in effect, your organization) to be perceived by the event guests. This is important because most banquets are held to support a charitable cause. As the event organizer, you would want continued patronage to your event so that more funds will be given to those in need. So, it is best to choose the ticket template that will best showcase the elegance and credibility of the people organizing and attending the said event program.